We are holding a mandatory informational meeting on Wednesday, April 18th at 5:00 PM in the high school auditorium. Coming to this meeting is mandatory for parents, and encouraged for students. Students are meeting with us this Friday, March 23rd to receive similar information. At this meeting, we will be going over a detailed powerpoint. You will also be receiving your student's three t-shirts, a trip itinerary, and a packing list. Additionally, the nurse will be at this meeting to collect any medicine your student needs to bring on the trip (your student will bring home a medication form prior to this meeting). If you cannot attend, please send another family member in your place to receive this important information. 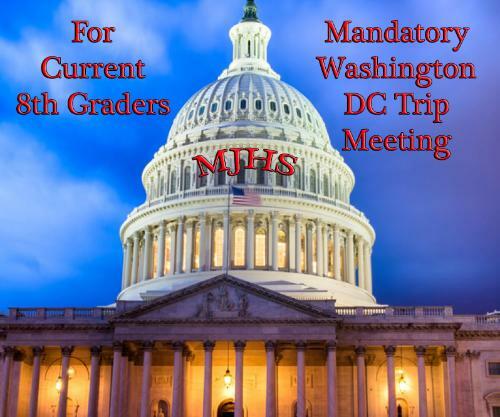 **If you are a chaperone, please arrive earlier for a 4:30 meeting to go over responsibilities and receive all required papers for the trip.